Date Added: 01/06/2018 by E.T. Back in the day when CDs were more affordable I enjoyed the audio improvement compared to cassette tapes. Then MP3s - and later other modern compressed formats - came into vogue, but then I unconsciously stopped listening to digital music without knowing why. I finally realized that the digital music was not satisfying to the human psyche. About three years ago I decided to replace my home stereo, but wanted to avoid the harsh, cold-clinical, entry level solid-state receiver that I had before and hurt my ears. Much of the music to which I listen, is digital, mostly CDs at home and downloaded music files while traveling. Last year I replaced my stereo's DACs with the LessLoss' Echo's End. My previous external DACs were definitely an improvement over the inexpensive built-in DACs of a CD player, car stereo, pc, and portable devices, however, there was still much room for improvement. The Echo's End has that necessary something that was missing, that breathed life back into the rendering of digital music. My older DACs rendered digital music more clearly, but the music was quite plain and uninteresting, even after upgrading my CD transport. Now, I often stay awake way past my bedtime wanting to listen to digital music through my Echo's End for just a few minutes longer, like my nephews asking their parents for five more minutes before having to go to sleep. Now, I prefer to listen to digital music only using my Echo's End and have relegated other digital audio devices to mundane tasks that do not involve music. I am thankful that the Echo's End has a sturdy carrying case, so that I can take my Echo's End with me when I travel. Was the inclusion of the sturdy case for the Echo's end part of LessLoss' plan not only to protect the Echo's End during shipment, but also to enable people to take their Echo's End with them when they travel between home and work, or relative's house? Brilliant plan LessLoss! Quiet, relaxed, with a sense of ease, and with a slightly distant presentation of the soundstage, with timing & dynamics that are more natural than hyped. Music becomes emotionally, as well as intellectually involving. Detail is present, in proper context. In other words, instruments and voices sound real, with all the details balanced, and heard as part of the fabric of the whole. Perhaps even better than another very quick set of cables that I use presently, there is immediacy in the strike & start-up of transients, with long trailing decays. Not so much about creating excitement, but rather showing off realistically what is so easily missed; it is the more musically satisfying approach. The generous offer with the introduction of the new cable line made me order a new set of speaker cables. I wasn’t sure what to expect, would the difference be big enough to make the purchase reasonable? When the cables arrived, the first thing that I noticed when I first touched it, was a fabulous feeling, very soft and nice, that is totally different to most other cables with their outside, mostly made of plastic in what form ever. This is the most flexible cable that I ever had in my hands. I can’t think of any problems to place the cable, even in sparse and cramped places. If you use cable lifters/supporters, you may need twice the quantity than usual. I tried to borrow an expensive cable set from a nearby dealer, or to make a comparison directly at the shop. That was not possible, as they didn’t have the time before christmas, nor had they any cables left to lend. So I can only report my own findings. By now the cables have a run time of approximately 140 hours or more. But right from the start the cables clearly outperformed my Zu cables. Actually I had a feeling as if these cables squeeze out the last drop of information from the signal that is running through it. Everything improved to an extensive degree. The imaging of the room information in depth and width now reaches far beyond the sides of the speakers. Instruments and voices got a much better separation, it is as if the imaging of the 3D picture of the sound gotvcompletely newly arranged. Acoustical instruments sound unbelievably realistic. Bass has an impressive clarity, punch and depth now. There is a big quantity of additional information that I hear with every played record, CD or file, that was simply not there before. 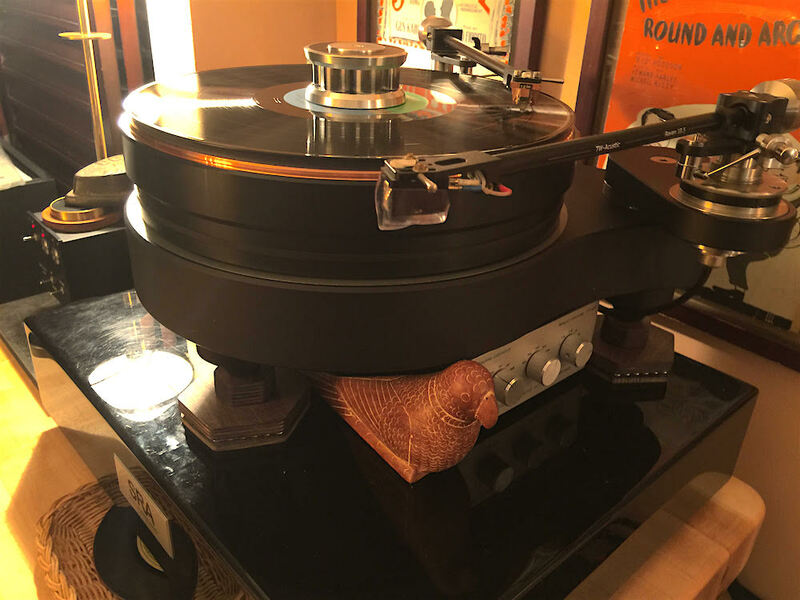 What really astonished me is, that the records or CDs that sounded excellent so far, where I didn’t expect a big improvement, reached new heights with the C-MARC cables that seemed impossible. And the best compliment to make is that the C-MARC speaker cables have a fantastic musicality. There are so much more information to detect, but these won’t come in a technical sort of way, I don’t hear any aggressive high frequencies, some records become much more listenable, as their sharpness is completely gone without the loss of any details. (Instead there is so much more detail.) That is simply wonderful.